I pretty much let out a squeal of delight when I first laid my eyes on these scoots. And yes, they too are from the BMW Mini family. 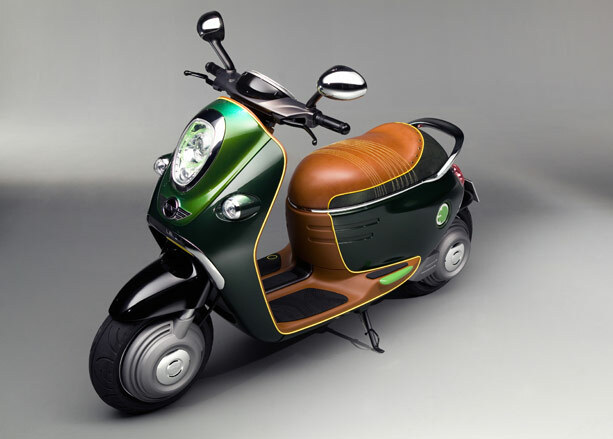 They are enviro-loving zero-emission e-scoots. Plug in and go. Now, the real question is: go Paul Weller modster with the top one or play it super cool and go for British Racing Green. Hmmm, I think my age and my wardrobe are a better match for the latter but my oh my, the former is deelish! sources: 1. world car fans. 2 & 3. wallpaper. Magic Bus! When I was little, one of my grown up adult cousins had an orange VW microbus. I was so excited to get to go for a ride in it when she came to visit in Peterborough. I dunno how a small town girl gets an idea like this in her head, but I have always wanted one. When I came across this photo, my microbus love affair was kindled anew. I mean, can you even stand how cool this is? Don't tell Suzi (my beloved, long-suffering, hard-working, under-powered and once-terribly-injured-on-the-401 Hwy Suzuki Vitara), but if I could have a microbus, Suzi would be history! I think one of the reasons why I love the Vdub so much is that essentially it's another place to decorate. Forget Starbucks, my third place is my car. source: via Coastal Living and Yolo Boards. Here's a truly cool version. It's an eco friendly concept by French Canadian designer Alexandre Verdier. It's a 4 cylinder hybrid with a 170W solar system on the roof. A GPS orients the solar panels to soak up the most power possible. Inside, the thing is tricked out with amazing storage, an entertainment system and on board computer. Verdier's own URL is inactive, but you can read more about this marvel at Inhabitat.com. (Hefty price tag: $129,000).